Enjoy these delicious, bite-sized bon-bons from one of the most prolific writers from the 20th Century, Gilbert Keith Chesterton. Or watch my TV interview on this great thinker: G.K. Chesterton interview. 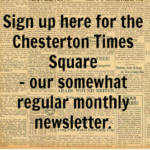 And, if you’re interested in attending our most delightful local Celebrations of Chesterton this side of heaven, check out the Louisiana Chesterton Conferences page. G.K. Chesterton and Charles Dickens had a lot in common. In fact both began as journalists and both nearly disappeared into the annals of the forgotten, except that Chesterton revived interest in Dickens in 1906 when he wrote a critical study of this likewise prolific author. Today others are bringing Chesterton back from the dead, so to speak, and for good reason. Everything he wrote about points to things going on in our world. Chesterton, like Dickens before him, wrote about something that never changes: human nature. 1. 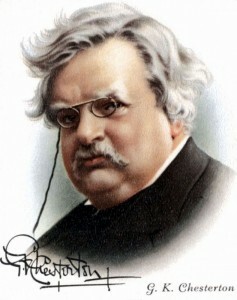 G.K. Chesterton and his wife Frances were unable to have children. They were, however, inclined to having the little guests over to their home for frequent visits. Gilbert would attempt to put together a daily column with a houseful of children on the one hand and a messenger waiting for his finished product at the door. Most of us would think of this as chaotic, but he not only thrived on this but exclaimed that he founded his ‘”social philosophy on the antics of a baby”. Chesterton believed in the principle of subsidiarity, that things which can be done on the most local level possible ought to done that way, beginning, of course, with the family, then neighborhood, town and so on. It is the opposite of waiting for big government to take care of matters. He believed that government ought not interfere with this system and only interject itself where absolutely necessary. “An honest man falls in love with an honest woman; he wishes therefore to marry her, to be the father of her children, to secure her and himself. All systems of government should be tested by whether he can do this. If any system- , feudal, servile, or barbaric does in fact, give him so large a cabbage field that he can do it, there is the essence of liberty and justice. If any system – , republican, mercantile or Eugenist, does in fact give him so small a salary that he can’t do it, there is the essence of eternal tyranny and shame.” Illustrated London News, March 25, 1911. “The whole object of real art, or real romance-and above all of real religion- is to prevent people from losing the humility and gratitude which are thankful for daylight and daily bread; to prevent them from regarding daily life as dull or domestic life as narrow; to teach them to feel in the sunlight the song of Apollo, and in the bread the epic of the plough. What is now needed most is intensive imagination. I mean the power to turn our imagination inwards, on the things we already have, and to make those things live. It is not merely seeking new experiences, which rapidly become old experiences. It is really learning how to experience our experiences. It is learning how to enjoy our enjoyments.” Illustrated London News, Oct 20, 1924. “I will not say positively that a toy-theatre is the best of all theatres; though I have had more fun out of it than out of any other. But I will say positively that the toy-theatre is the best of all toys. It sometimes fails but generally because people are mistaken in the matter of what it is meant to do, and what it can or cannot be expected to do; as if people should use a toy balloon as a football or a skipping rope as a hammock.” Collected Works of G.K. Chesterton, Volume XI, p. 23. “You never work so well for art’s sake as when you are working for something else.” Daily News, June 25, 1904. “Philosophy is always present in a work of art.” Illustrated London News, Jun 15, 1929. (And my personal favorite…) “An art school is a place where about three people work with feverish energy and everybody else idles to a degree that I should have conceived unattainable by human nature.” Autobiography, CW16:94. “It is said truly in a sense that Pan died because Christ was born. It is almost as true in another sense that men knew that Christ was born because Pan was already dead. A void was made by the vanishing world of the whole mythology of mankind, which would have asphyxiated like a vacuum if it had not been filled with theology.” – “The End of the World”, The Everlasting Man.